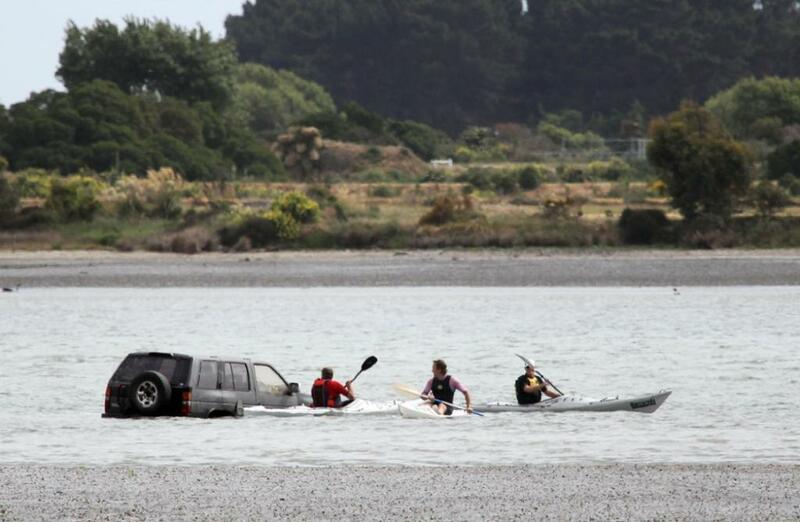 Kayakers on the estuary investigate the the stricken 4WD. The Christchurch estuary's soft mud and a rising tide have claimed a 4WD despite frantic attempts to free the stricken vehicle. 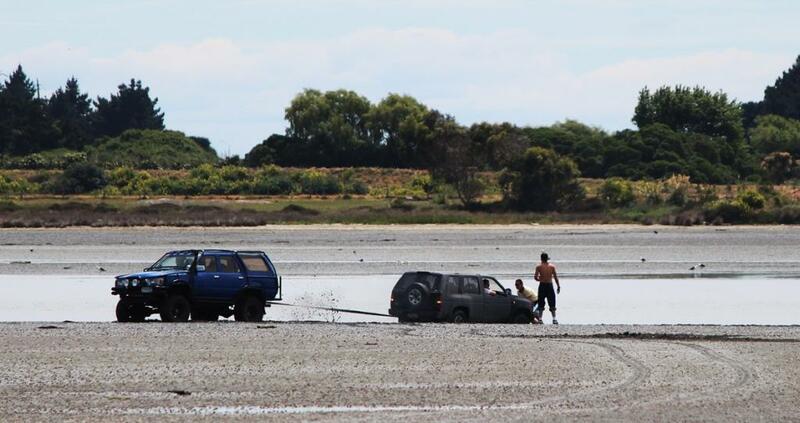 The 4WD's driver could be forced to pay for removal costs after getting stuck in an estuary. The driver of a vehicle seen doing doughnuts before it became stuck in mud at the Avon-Heathcote Estuary could be fined or prosecuted and forced to pay hefty removal costs. Environment Canterbury (ECan) says the owner of the Nissan Terrano is overseas and the regional council is struggling to identify who was behind the wheel. The 4WD is not listed as stolen. Police may be called to help with the investigation, the regional council says. One eyewitness said it was common to see windsurfers and kayakers on the estuary, but "not turkeys in a 4WD". Witnesses have told The Press the vehicle - with up to five people inside - entered the estuary at low tide, near Mt Pleasant Yacht Club on Main Rd, shortly before midday Saturday. It was then seen doing doughnuts before becoming stuck near the main channel. Frantic attempts were made to tow the vehicle out but eventually it was abandoned and swamped by the incoming tide. ECan compliance enforcement manager Brett Aldridge said Christchurch City Council rangers were investigating but had yet to find out who was driving. Enquiries showed the owner of the vehicle was in Australia, he said. Police might be called to help identify the driver. They could be forced to pay the cost of recovery and could be fined or prosecuted under the Resource Management Act for using a vehicle in a coastal marine area, Aldridge said. A small amount of oil might have leaked from vehicle but the environmental impact of the incident appeared to be minimal. Attempts to salvage the wreck will be made later today. "I'm not sure how we'll tackle it. It will be a hell of a job I would imagine.". SOS Towing spokesman Trevor Lilley said the company was called to try and haul the vehicle out but refused because it did not want to risk the tow truck in the rescue from the sticky mud. Scott Todeck was driving past in his blue 4WD when he saw the stuck vehicle. "I just couldn't comprehend why he'd drive out there . . . and then thought ‘I feel sorry for the guy'." He was offered $200 to haul it out but his attempts were unsuccessful and he told the driver to keep his money. "He'll learn the hard way," Todeck said. Civil Construction employee Willie Carberry said he was working at a site nearby and watched the incident unfold. "I saw him drive on to the estuary and start doing doughnuts," Carberry said. Later, a middle-aged man came to the site he was working at and asked for any equipment that could be used to pull his 4WD out. Carberry said one of the company's diggers would cost about $250 an hour to hire. The man said he could not afford that and left. In the end the vehicle was abandoned and swallowed up by the tide. "I have no remorse [sic] for the guy. He was just being dumb," Carberry said. "Kayakers and those wind surfers are what I normally see out there - not turkeys in a 4WD." Aldridge said incidents of people driving on the estuary were rare. "More often than not it's joy riders - I think that's what's happened here."